Topics: Cactus, Current Events, Meetings, and Agencies Supported. abilenecactuslions.org Home Computer Security - How to Protect you Computer - ( January .. It has 2 DNS records, auth0.ispdone.com, and auth1.ispdone.com. It is hosted by American Registry For Internet Numbers (Virginia, Chantilly,) using Apache web server. 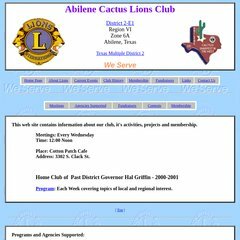 Abilenecactuslions.org's server IP number is 69.39.47.80. PING www. (69.39.47.80) 56(84) bytes of data.